A couple weeks ago, Andy and I went to Boston for our annual trip to participate in the MIT Mystery Hunt. We had a blast! One of the highlights of the trip came, for me, on Sunday night after the hunt had ended. We joined a group of our charming NPL friends for dinner at the incredible Gargoyles on the Square in Somerville, MA. Now, we had heard that this place had the best martinis in the Boston-area, and so I assumed it was a bar (I mean, it’s called ‘Gargoyles’, after all). I was surprised and utterly delighted when we were ushered into a private dining room and I was handed a menu that listed some of the most fun and original sounding dishes I’ve seen. This recipe is my stab at recreating the absolutely extraordinary chestnut bisque I had at Gargoyles. The bisque was served in a very large bowl with a wide rim. An amaretto yogurt was smeared thickly on one third of the rim of the bowl, and three little towers of a truffled granola were piled atop the yogurt. 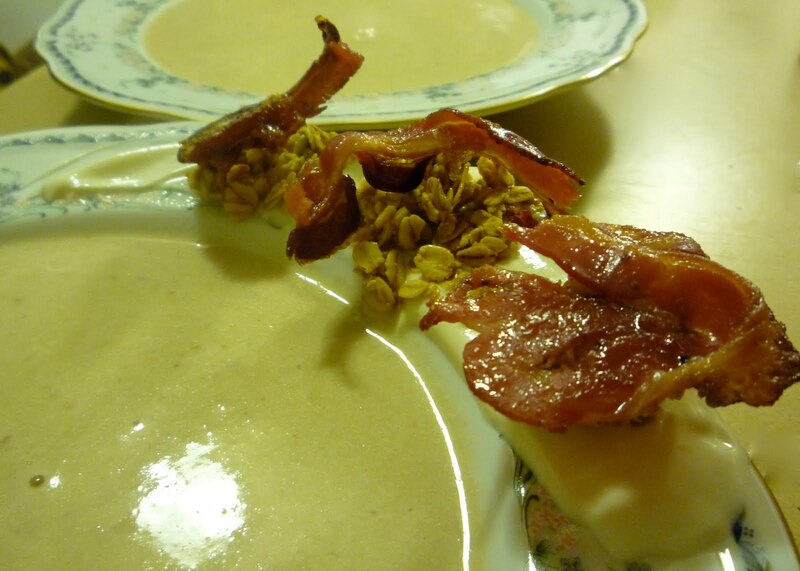 On top of each tower of granola was a quartered slice of candied pancetta. To top it off, the whole bowl was set on top of a dainty branch of charred pine, so that you smelled the pine smoke while you were eating the bisque. It was so. much. fun. 2. Roast the chestnuts. People are always saying to slash an “X” through the chestnuts, but don’t do this! 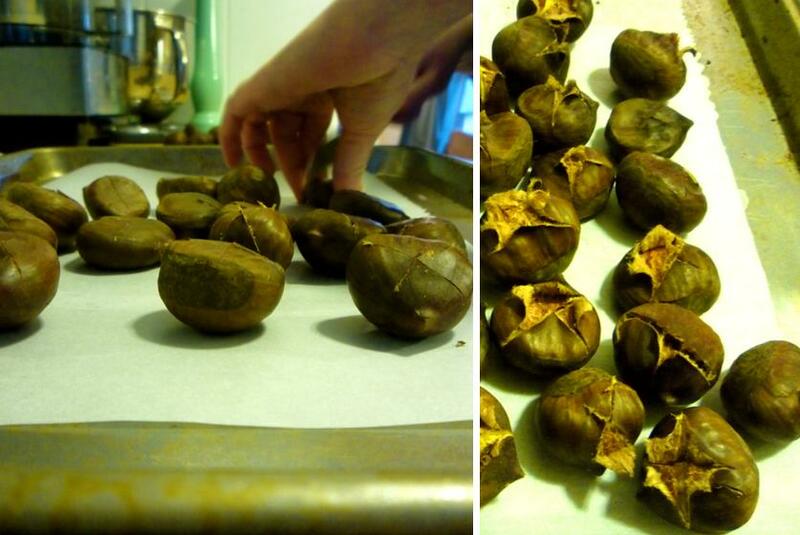 Instead, go with the Martha method of slicing almost all the way around the chestnut like you’re drawing the equator. This will make peeling much easier! (You’ll note from the picture below that I learned this the hard way). Place them on a parchment paper lined baking sheet. Add the two shiitake caps to the same baking sheet, drizzle the shiitakes with olive oil and sprinkle lightly with kosher salt. Put the baking sheet in the oven and roast for 20 minutes. 4. Melt the butter in heavy large pot over medium heat. Add onion and celery and saute until softened and lightly golden, about 10 minutes. Stir in the roasted chestnuts and shiitakes, then broth. Increase heat to high; bring to boil. Reduce heat to medium-low, cover, and simmer 20 minutes. Remove from heat and allow to cool slightly. 5. While the soup is cooking, prepare the garnish. 6. For the Candied Pancetta, remove the parchment from the baking sheet you used to roast the chestnuts, line the baking sheet with foil, and set a wire rack on top. Place the pancetta on the wire rack on the baking sheet and bake for 15 minutes, or until the pancetta begins to brown. Remove the pan from the oven and brush the slices with maple syrup and bake for another 5 minutes, or until the pancetta is golden brown. Set aside. 7. For the Amaretto Yogurt, in a small dish, stir together the greek yogurt and amaretto and set aside. 8. Working in batches, transfer soup to blender and puree until smooth. Transfer back to the pot. 9. Stir cream into soup and bring to a simmer. Season to taste with salt and pepper. 10. To assemble, spread the yogurt on the rim of your bowls (see picture above), and set three piles of granola on the yogurt. Balance a piece of candied pancetta on top, and enjoy! Oh, and if you have access to a pine tree, cut off a few tiny branches and set them on fire. Then snuff out the flame and set the smoking branch on a plate under your bowl of soup. It’s really fun! Next Article Super Mario Cake! you are setting branches on fire for ambiance? geez. now i feel bad about making grilled cheese again for dinner. OMG this sounds wonderful. Dad and I want to know what pacetta is. I can't wait to come for a visit.Will you make this for me? thanks! pancetta is like italian bacon- it's cured, but not smoked like regular bacon. quite tasty. Arielle, looks delicious — like your blog very much! Hi Arielle! You should post this one to Food52! It sounds fantastic! thanks, mrslarkin! it really is a fun soup 🙂 i think i will post it!